The first half of Agents of S.H.I.E.L.D. season 3 largely dealt with the fallout from season 2 - namely, the Terrigenesis of Inhumans all around the globe - as well as the ongoing threat of Hydra. But, in the latter half of season 3, Director Phil Coulson (Clark Gregg) was forced the deal with both the emotional consequences and real-world repercussions of his decision to kill Grant Ward (Brett Dalton) on Maveth. As a result of Coulson's choice, Hydra was able to bring back the ancient Inhuman Hive from Maveth, this time inhabiting Ward's body. Although Hive was defeated, it seems the season 3 finale will have an impact on Coulson's character going into season 4, which will premiere later this year on ABC. 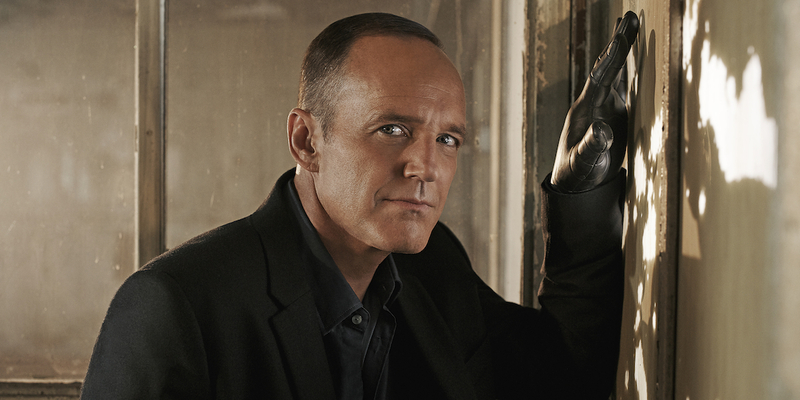 Now, Gregg has teased a bit about what to expect from Coulson when Agents of S.H.I.E.L.D. returns for season 4. In broad terms, Gregg is speaking about the end of the season 3 finale, which jumped ahead six months and picked up with Coulson's team spread out across the globe. Coulson was shown attempting to track down the rogue Daisy Johnson (Chloe Bennet), who seems to have traded in her S.H.I.E.L.D. agent status to be an Inhuman vigilante as part of her grieving process over losing Lincoln (Luke Mitchell). As Gregg points out, Coulson will not only be dealing with the loss of Lincoln, but the defection of Daisy as well, when season 4 kicks off. In addition to exploring Coulson and Daisy's grief and its effect on S.H.I.E.L.D., the Marvel series will deal with Life-Model Decoys, or LMDs, developed by Holden Radcliffe (John Hannah). The technology was introduced in the final moments of the season 3 finale, setting up season 4, and will surely play into the fact that the S.H.I.E.L.D. team has lost a number of agents and allies, including the most recent death of Lincoln. Of course, as with all properties under the Marvel Studios banner, details about Agents of S.H.I.E.L.D. season 4 are being kept under wraps. Previously, executive producer Jed Whedon did mention that the team's loss of Lincoln and the team's showdown with Hive will have "affected their plan moving forward and the way they operate." So, emotional ramifications of the loss of an agent and the technology of the LMDs will both play a big role in season 4. But, still, the most burning question for fans of Agents of S.H.I.E.L.D. may be: Who has replaced Coulson as director? Agents of S.H.I.E.L.D. will return with season 4 this fall on ABC.